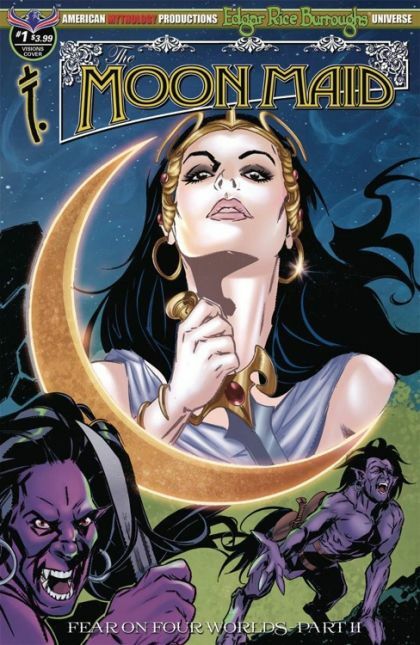 Deep beneath the crust of the Earth's moon lies a fantastic world of lush, purple vegetation, hideous monsters, the half-human/half-horse Va-gas, and the most incredible, alluring creature in the universe... Nah-ee-lah, the "Moon Maid!" American Mythology is proud to present Edgar Rice Burroughs' immortal, sci-fi action adventure in comic book form, in all-new adventures that finds Nah-ee-lah a prisoner of the cannibalistic Va-gas, but salvation arrives in the form of two time and space-travelling adventurers from the prehistoric continent of Caspak, "The Land That Time Forgot!" 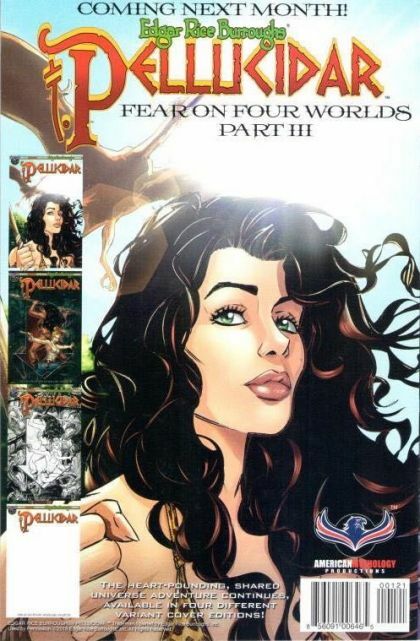 This thrilling first issue also serves as the second chapter in the "Fear on Four Worlds" saga, which ties Burroughs' greatest fantasy worlds together into one shared universe, including Va-nah (The Moon Maid), Amtor (Carson of Venus), Pellucidar, and Caspak (The Land That Time Forgot). The Moon Maid comes with four covers - Main Cover by Mike Wolfer, Visions of the Moon & B&W Limited Edition Covers by Gabriel Rearte, and a Blank Sketch Edition.